How do you cope with your vicar? Why do you need to cope with a vicar? If you have a problem coping with the church, is the vicar part of the problem? In some churches the title is rector, curate, priest, pastor or minister, but the point is that someone is in charge. If you can’t relate to that person, you will find it hard to feel at home in the church. I know, because I’ve had experience, but it’s something I didn’t cover in my book How to Cope with the Church or in my recent blogs on the subject. What could be wrong with your vicar? The issues I’ve encountered come in various categories. Doctrine. You don’t agree with his/her take on the Bible or some aspect of church policy. Preaching. Not ‘what’ but ‘how’. Over your head, patronising or just too long? Leadership style. You find it too dictatorial, or too laissez-faire. Management ability – lack of. Someone who is inefficient, disorganised or unreliable can be really irritating. Personality. Too distant or too in-your-face? Too serious or a would-be comedian? Do you need to change your vicar by changing your church? I have experienced all of the above, and, looking back, I can see that some of the issues say more about me than about the vicar. I learnt from each of them, even when I decided to move to another church, which I did only once, not counting times when I moved home, when I could not accept his High Church beliefs. Even so, I am glad of the experience, as it made me really question my own beliefs. What mattered? What did the Bible really say? Does your vicar have good points too? I have learnt that a lot of the qualities listed can be seen as good or bad depending on your personality. Can you learn to value different types of leader and see that nobody is ideal for everyone? Do you need to examine your priorities? By the way, some of these things are addressed in some churches by having team ministries, where one person’s weaknesses are offset by a colleague’s strengths. How God answered my prayers for coping with my vicar. I once had a vicar whose annoying features seemed to be getting worse, or at least they were annoying me more and more. It was mainly about inefficiency and personality. I prayed about it with someone who felt the same way but was coping better and God helped me to see the man’s good points, which were Faith and Love. Then I saw that the rest of it was far less important. Perhaps God wants to show you something similar, if you pray about your problems coping with your vicar. What if none of this applies to your vicar? There are some vicars who don’t tick all the right boxes but just inspire you and share their vision with you. None of the above apples to them. If yours is one, you won’t need any advice on coping, because you won’t notice their shortcomings. Author John MurrayPosted on September 13, 2018 Categories UncategorizedLeave a comment on How do you cope with your vicar? When and why did I find it hardest to relate to the Church? Do you find it hard to relate to the Church? Many people, even people who believe in God, cannot relate to the Church. I wrote about this in my book How to Cope with the Church. Some say that the one thing it lacks is an account of my journey. How did I learn to cope with the Church? I wrote recently about how I learnt to relate to the Church at University and in the years immediately following. Two things happened next which changed my life dramatically. Marriage is a subject in itself. It certainly added a new dimension to the problem of relating to the Church as well as adding a new dimension to my life. Perhaps I will write about that sometime. But for now, Wales. Why did the move affect my ability to relate to the Church? In a few years we were to live in North, Mid and South Wales. An interesting experience (or three experiences, if you like) but with certain challenges. Often, we were in a new place, new jobs and having to choose a church. We found people in Wales had more attachment to their denominations than was usually the case in England, and were often suspicious of people from a different church background. It was harder to get different churches to cooperate to put on events. In some cases, Welsh-speakers regarded English-speakers with caution, especially in Welsh-speaking chapels. A lot of people didn’t welcome change, of any kind. Many people focused on the events in Wales in the early twentieth century, although not all interpreted them in the same way. One church we went to for a time was more of a social club than anything. What could we relate to? The words of the Bible and most hymns were as true as they always were. In the Anglican Church, the words of the liturgy, the set prayers, were as valid as ever. In every church, we found at least a few people we could relate to. They cared for God and for other people more than for the institution. Sometimes we visited churches that were changing, even if it meant a bit of a journey on those Sundays. We got some good teaching from books and tapes (remember them?) by preachers who could communicate. We went to some Christian conferences to get encouragement and teaching. Note: that was many years ago. I believe the churches in Wales have moved on since I left. Was there a connection? How did we relate to the Church when we came back to the North West of England? I will write about that soon. Meanwhile, perhaps you want to read How to Cope with the Church? 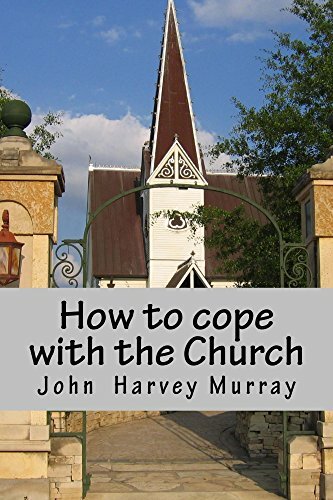 Author John MurrayPosted on September 7, 2018 Categories UncategorizedLeave a comment on When and why did I find it hardest to relate to the Church?